Girly notebook and a winner! 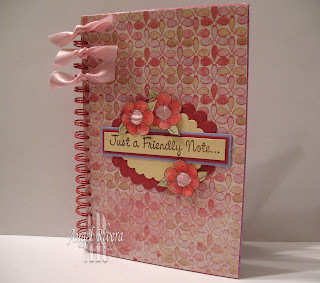 Here's an altered notebook I made for the DRS Designs blog challenge which you can check out here. I have a few of these which I'd gotten from the dollar store over a year ago. This yummy dp is the new line from My Mind's Eye called Laundry Line ~ it's all SO delish!! The sentiment and flower are from DRS Designs. The flower is a ribbon slide, so I kept with that and used pink satin ribbon for the centers. I tied the same ribbon on the side, as if it wasn't girly enough! Yea, I don't think I have to worry about my boys wanting to use this notebook! hehe! Now, the winner of my blogtest is Jennifer E.!!! Yes, I bought some nesties recently (circle ones and large scalloped ovals, only because that's all Hobby Lobby had at the time!) and I bought my first and only copic marker, cool grey no. 3. Give me your info so I can mail you your surprise! Thanks for stopping by! project info: stamps ~ drs designs. paper ~ vanilla, banana, ruby red, amethyst, dp. ink ~ choc, ruby, celery. access. ~ nesties, ribbon. First things first, my dear friend, Carolyn (Cammie), has designed a wonderful stamp set (available from Gina K.) of which she's sending all proceeds to the Alzheimer's Association. She's now giving out some MAJOR blog candy and all you have to do is make and send a card to the caretaker of a person affected with Alzheimer's (there are a few other rules which she lists on her blog). Read all about it on her blog here. This is the card I will be mailing out to the address she provided on her blog. 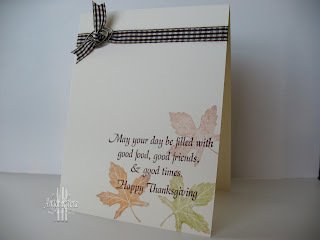 Now about the card, all stamps used are by DRS Designs. I colored with reinkers (the few that I have), ink from ink pads and markers. I added crystal effects to the apples and pumpkins, so it looks really cool IRL (don't it always!). 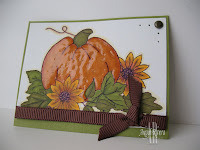 The pumpkin layer was stamped with the leaf in chocolate after stamping off once. There's also faux stitching around the border of the ruby red card base. Now my little blog-test (instead of CONtest, get it?? hehe!) for you is can you tell what TWO things I recently purchased that I used on this card?? The first person to correctly name these TWO things (and you might have to look closely) will get a little surprise from me! I won't list everything in my "card info", just the main schtuff I used. I will have the contest open until Sunday, 28 Sep and will post the winner Monday morning. Good luck!!! card info: stamps ~ drs designs. paper ~ ruby, pumpkin, chocolate, ww. ink ~ chocolate, black, artichoke, pumpkin, saffron. access. ~ ?, ?, markers, piercer, brads, crystal effects. 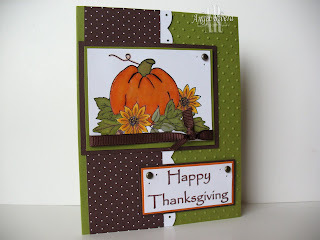 Here's a card I'd made that almost qualified for the Limited Supplies Challenge over on SCS. I just had one too many colors of ink! Oh well! hehe! I inked up this leaf from DRS Designs using pumpkin, olive and cocoa and rock n rolled them all in chocolate. 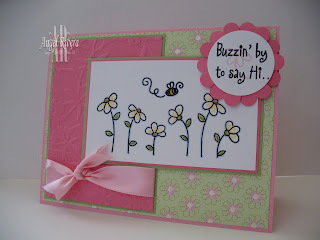 I stamped off once before stamping onto the vanilla card base. 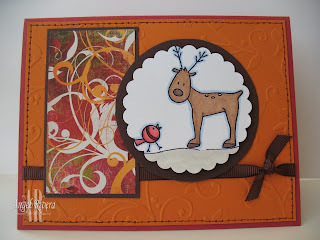 The sentiment is another NEW RELEASE from DRS Designs ~ I inked it up in chocolate. I've had this gingham ribbon for probably 3 yrs!! But hey, it came in handy today, right?? Added a little hardware to it to finish it off. Simple and classy, doncha think???? Ok, going to get some stamping time in before the Saints game starts!!!! Have a wonderful Sunday!! card info: stamps ~ drs designs. ink ~ pumpkin, olive, cocoa, chocolate. paper ~ vanilla. access. ~ ribbon, hardware. Yep, it's that time again! You can find Elzybell's 2nd sketch challenge here !!! I used this sweet little juggling penguin. I colored him with my ol' SU watercolor pencils and a blender pen. I put liquid applique on the snowballs and "ground". I decided to not add a sentiment to the front, but I think the white satin ribbon (thanks, Stacy!!) and fun dp are enough to make this a cute card! card info: stamps ~ Elzybells. paper ~ ww, non-SU red and dp. ink ~ black. access. ~ ribbon, circle punch, watercolor pencils, liquid applique. I ran half of the card base through my cuttlebug using the swiss dots folder. The white scalloped edge was done w/ the SU corner rounder, then I punched a small hole in each scallop using a regular hole punch. 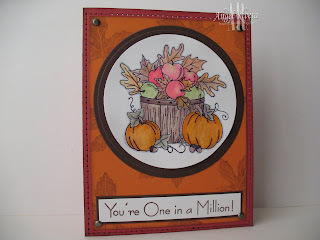 The sentiment is a NEW stamp available at DRS Designs TODAY!!!! I added some piercing and brads in the corners. So go here, DRS Designs, and check out what the DT did with their ATCs and then go try it out for yourself!!!! card info: stamps ~ DRS designs. paper ~ olive, choc, ww, pumpkin, dp. ink ~ choc. access. ~ brads, piercer, markers, crystal effects, punches, ribbon, cuttlebug. Well, Ike is gone and we made it through! It was a rough, scary night, didn't sleep much (fortunately, the boys did!) and we ended up w/ just some shingles off the roof and a leaning fence, but easy repairs. So glad it's over with! We were without power for about 10 hrs, but luckily, it came back on early this afternoon. I sure hope everyone else made it through ok and gets power SOON!!! As we prepare for Ike's approach, please keep us and everyone in and along the Texas/Louisiana border. I'll post an update as soon as I'm able to. Hugs!!!!!!!!!! Yay, we've begun the first of our challenges over on the Elzybells Blog!! This weeks sketch challenge was made up by Jeanne Streiff. You can see that I put my cuttlebug to work again and I also adding faux stitching to that layer. That yumm-o dp is new from Bo Bunny. I think the next thing to get on my never-ending shopping list is a set of Nestabilities. I only have a coluzzle and 2 pink (forget the size) marvy punches, as for as cutting systems go. If you know of a good place to get these, please let me know! (think I'll check HL) Back to the card ~ again, all coloring w/ SU markers. I used ruby red and cameo on the little robin ~ ain't he sweet?? I watercolored moss as the ground and then outlined them with my bashful blue marker. Thanks for peeking in! card info: stamps ~ elzybells reindeer and robin. paper ~ ruby, pumpkin, choc, ww. ink ~ black. access. ~ markers, punch, coluzzle, ribbon, piercer. How cute is this stamp?? I *love* it! Supah simple to color, which I did w/ SU markers. And yes, folks, I finally crawled out from under my rock and bought myself a Cuttlebug!! This started out as last weeks' sketch, but I ended up changing it a bit. I cut in between each scallop and bent back every other "petal" to give it more dimension. And I think this dp is just so adorable ~ the flower centers are sparkly! Thanks for taking a peek!! card info: stamps ~ Elzybells. paper ~ pink, regal, celery, dp, ww. ink ~ black. access. ~ markers, punches, satin ribbon, cuttlebug.